Dean Baker had a sort of snarky reaction to the latest round of “teacher shortage” stories: Employers should raise salaries to attract more workers. He’s right, teacher pay is low and flat, but Baker’s solution of across-the-board raises only makes sense in a world where we were suffering from a general, national teacher shortage. We aren’t. Teacher shortages tend to be regional and specific to particular schools and particular positions within schools. So while across-the-board raises might be a good thing to do, they won’t solve the long-term problem of hard-to-staff schools and subjects. To do that, districts need to implement extra incentives to make their shortage areas more attractive. But districts aren’t doing that. 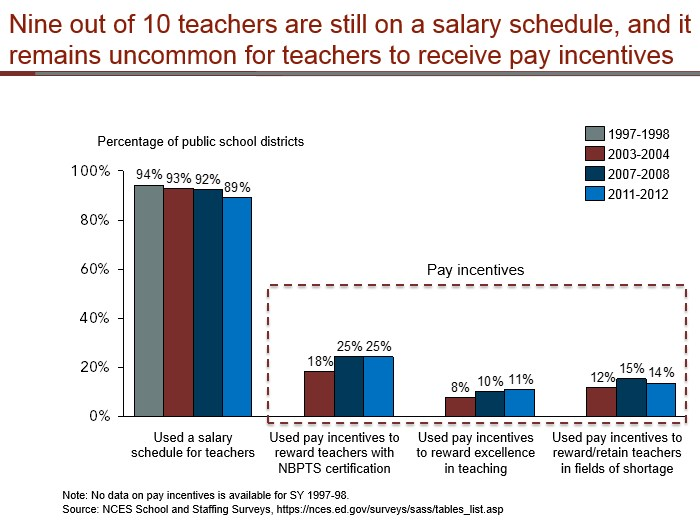 As we showed in a report last fall, the percentage of districts using extra pay incentives for teachers in shortage areas has barely budged. It was at 12 percent in 2003-4, and it was only up to 14 percent as of 2011-12. Even if we take merit and performance off the table, more districts should recognize that, if they are having difficulty hiring for certain positions, year after year after year, they should do something to make those positions more attractive. Higher pay would be a good first step. This entry was posted in Teacher Effectiveness and tagged Center for Economic and Policy Research, Dean Baker, teacher salary, teacher shortage on August 21, 2015 by Chad Aldeman. FWIW, I actually did not advocate any specific structure for pay increases. My comments were direct to a series of news stories that talked about shortages without ever discussing pay. Seems to me that higher pay is a pretty standard route for getting rid of shortages. The higher pay does not have to be across the board if the shortages are not across the board.